The sap of milkweeds contains both poisons and latex. The rubber-like latex can gum up the mouthparts of plant eaters that are not specialized to deal with it. In this case the bugs avoid the latex-carrying channels with their piercing-sucking mouthparts. Later sap oozes up out of the puncture wounds created by the bugs where it dries and seals the hole. 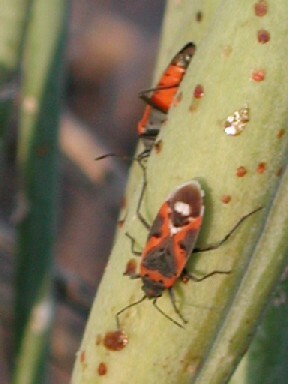 Immature stages of milkweed bugs stay together and their bright red and black pattern makes them very conspicuous. They likely contain significant quantities of poisons sequestered from the milkweed. If a bird bites one it is highly unlikely that it will sample another. Photo taken at Phoenix, Arizona on Desert Milkweed -- Asclepias subulata. 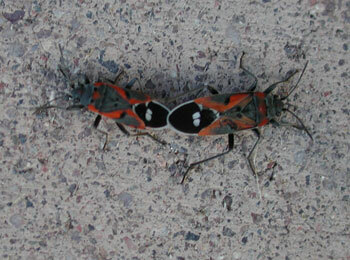 The photo is hosted at Wikimedia where there are more picutres of Lygaeidae Bugs as well as more information about Aposematism, i.e., bright warning coloration. Photo taken at the Desert Botanical Garden, Phoenix, Arizona. Photo taken in Phoenix, Arizona. 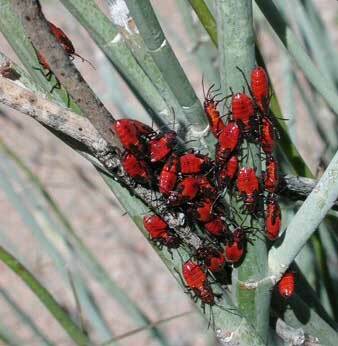 When milkweed is not available these seed feeders will feed on a wide variety of other plants including fallen fruits of palm trees.